The 'Botanical Garden' series features an amazing amount of detail, with a myriad of flowers and the odd garden friend for added authenticity! 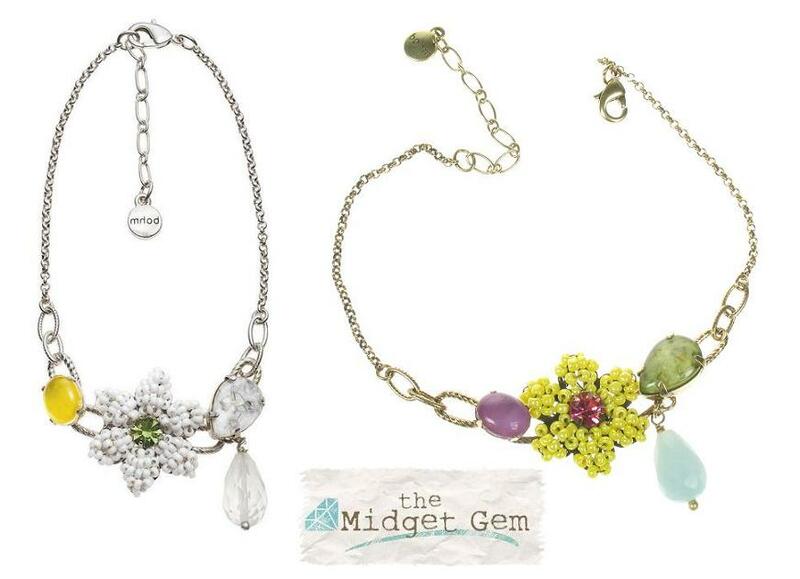 The fine attention to detail is captured in seed bead woven flowers, delicately enamelled bees, jewel framed cabochons, pressed glass leaves and a pretty smattering of Swarovski crystals, faceted quartz and lampwork glass drops. Available in gold plate with multi-bright shades and silver with white and yellow. Stunning linear pendant necklace. Featuring a feast of botanical flowers. Smallest bead 1.4cm/14mm largest flower 3.5cm/35mm. Length of the pendant is 11.5cm/4.5 inches. Adjustable length 43cm/17 inches to 51cm/20 inches. Flower bracelet. Featuring a seed bead woven flower, claw set cabochons and a faceted quartz drop. Smallest motif 1cm/10mm largest beaded flower 3.2cm/32mm. Adjustable length 18cm/7 inches to 23cm/9 inches. Stunning anklet/ankle chain. Featuring a seed bead woven flower, claw set cabochons and a faceted quartz drop. Smallest motif 1cm/10mm largest beaded flower 2.5cm/25mm. Adjustable length 23cm/9 inches to 28cm/11 inches. Two 'Bobby Pin' hair clips with flower decorations. A woven seed bead flower and a Swarovski crystal flower. The flowers measure 2.5cm/25mm. Bobby pins measure 5.5cm/55mm in length. Clip-on earrings. These pretty daisy flowers have a very retro edge to their design. Very comfortable to wear. 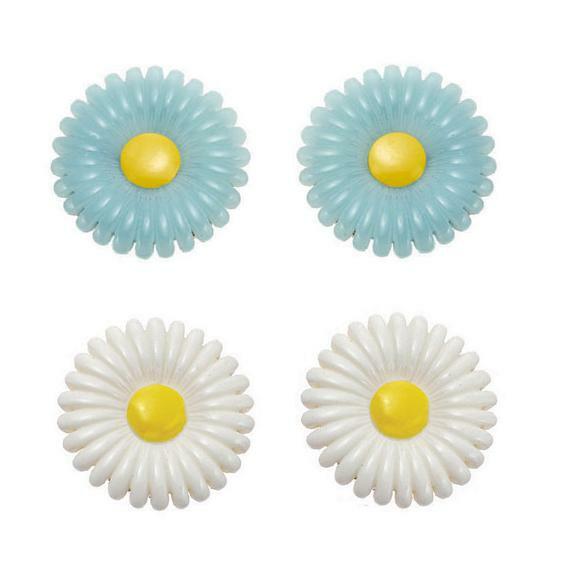 'Lucite' daisy flowers with hand painted centres that measure 2.5cm/25mm/1 inch diameter. Stunning corsage hinged bangle. Featuring a feast of botanical motifs: a bee and various flowers. Smallest motif 1.3cm/13mm largest beaded flower 3.2cm/32mm. Inner diameter 6.5cm/65mm.